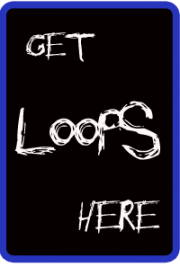 A much needed app is finally here. 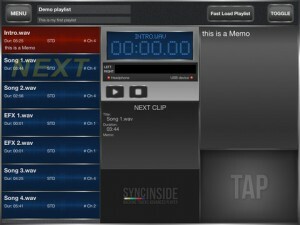 Are you looking for an app that allows you to play backing tracks on an iPad so that you can jam along with them live? 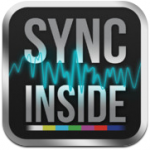 Connect a compliant USB sound card to your iPad with the Camera Connection Kit, SyncInside will play the stereo backing tracks through the sound card and the click through the headphone. All with a few simple and intuitive gestures. No more end clip nightmares, no more clips that start unexpectedly or exhausting researches of the next clip… a simple tap and the correct clip starts ! SyncInside stops at the end of every clip, it automatically queues up the next clip and waits your tap. You can set any clip from the playlist as the next to be played, managing the playlist variations in a very simple way. Managing your show has never been easier. SyncInside manages the two stereo files syncronised play (file 1: stereo backing tracks, file 2: click and/or timecode) or a single file (4 channel interleaved). Camera Connection Kit and a Class compliant USB sound card are required to exploit the multitrack features.